Computer Science Education – Don’t Get Left Behind www.HomeschoolProgramming.com by Chris Yust, Homeschool Programming, Inc. Today, the United States faces a critical shortage of trained software engineers. We are not producing enough trained computer scientists to fill these high-paying jobs! The job market for software engineers is projected to grow by 30% over the next decade. How will our nation respond? Public schools and the federal government are slowly beginning to realize that concrete action is needed to solve this problem. Many states and large districts such as Texas, Arkansas, New York, Chicago, and Florida are working on legislation to require computer science as a core subject or to make computer science available to all students! How can homeschool families keep up with this demand for new computer science instruction? 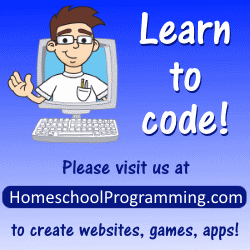 Let Homeschool Programming help! Since 2008, Homeschool Programming has provided high-quality, self-study curriculum to meet your computer science needs. We teach middle and high school students how to create their own websites, write simple computer programs, design video games, and more! Students can learn to code from the experts. Parents don’t need computer science expertise to offer this critical subject. Each self-study course comes as a turn-key system with step-by-step lessons, instructional videos, teacher’s notes, fully coded activity solutions, and tests and answers. We offer fast, personal technical support and gladly answer student questions on any subject. Homeschool Programming was founded by homeschool parents and software engineers. Our curriculum is perfect for that middle or high-school transcript that needs to show a credit for computer electives or computer science. We are passionate about bringing this subject to homeschool students and inspiring the next generation of computer scientists! Please visit us at www.HomeschoolProgramming.com and get started today!